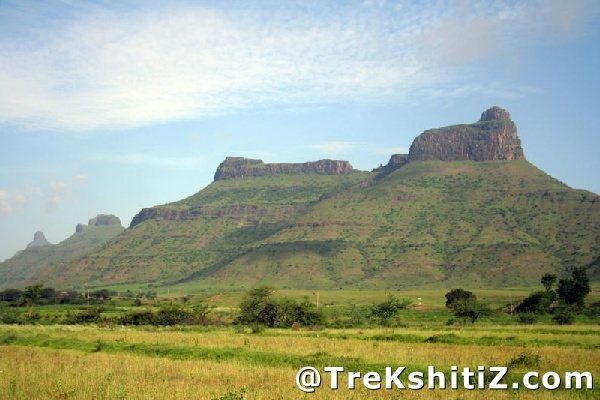 The Ajantha-Saatmal mountain range which runs East-West has many forts viz; Achala, Ahivant, Markandeya, Ravla-Javla, Kanhergad, Dhodap and Kanchana. The battle of Kanchanbari was fought in the area surrounding this fort. �Bari� means a valley. Kanchan fort must have been built to keep an eye on the trade route passing through this valley. Kanchan fort is divided into three parts, two of them which are known as Kanchan-Manchan. A 3 hour trail from Kheldari village takes us to a big rock wall which has steps built in it reaching the top. Before the steps towards right we can see some caves. On the top, there are 5 water tanks built in rock. After seeing this, descend the rock cut steps and traverse the rock wall to reach its western side. Here we can some remnants of entrance gate and fortification wall. Moving ahead, we come across 2 tombs and ruins of some structures. The west edge of the fort has two more rock surfaces having one water tank each. One has to reach Nashik and board a bus from Central Bus Stand going to Satana and alight at Kheldari village. 3 hours from Kheldari village.